I started playing with The Luke Smathers String Band in 1975. My eight years in the band were a wonderful education both musically and personally. 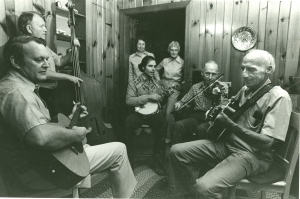 Luke called his music “Mountain Swing.” It embraced the old time fiddle tunes native to Canton, NC as well as the popular swing music of the 1930s and 40s. The band had originally formed in 1930 and continued until Luke’s death in July 1997. Over the years the band played for many local dances in Canton, NC. And in the 1970s and 80s when I was with them we played quite a few folk festivals as well as the Worlds Fair and the Smithsonian Institute. But gigs were never the goal of Luke’s band. It was the practice sessions that were most important! Every Sunday evening (except Christmas) we would practice in Luke and Bea’s kitchen. This was playing just for the joy of it, pure and simple. When I left the band in 1984 Laura Boosinger took over the banjo chair and continued another 13 years. We made two Albums “Mountain Swing” in 1977 and “In Full Swing” in 1981. Mountain Swing is a rare blending of old-time mountain music with the popular and swing tunes of the 1920’s, 30’s and early 40’s. The Luke Smathers String Band from Canton, North Carolina is one of the few traditional bands still playing this style of music. 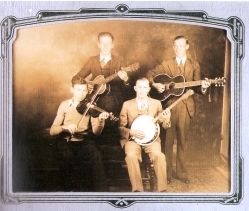 Brothers George, Harold and Luke Smathers formed the band in 1930, and played continuously until 1943. The band began playing regularly again in 1968, leaving their earlier repertoire basically unaffected by 25 years of musical change. The Smathers play music for pleasure and have never counted on it as a livelihood. During the 1930’s they were the favorite band at dances, being able to deliver a hard driving square dance tune as well as the latest fox trot. On occasion they broadcast over Radio WWNC in Asheville, NC. Even though they performed for the local public, they never attempted to commercialize their music, keeping enjoyment the sole motivation for playing. Today it is this same motivation that brings the band together every Sunday night at Luke and Bea’s kitchen. 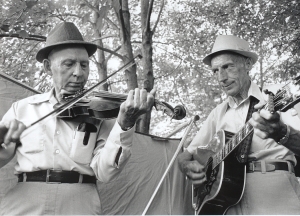 The band had its beginnings in the late 1920’s when brothers Luke, Harold and George were part of a local string band playing only old-time fiddle tunes. At that time Luke was playing 5-string banjo, with Harold and George on guitar. But the popular tunes of the day were making their way into the mountains through records and especially over battery-powered radios. The WLS Barn Dance out of Chicago was a particular favorite, as it always featured popular and sentimental songs of the day as well as hillbilly music. It was also the first radio station with a western swing band on the program to reach Western North Carolina. Some of the recording and radio artists that were favorites of the Smathers Band included Bob Wills (Brown Skinned Gal), Red Foley (Methodist Pie, Echos), the Westerners (Texas Plains, and the possible source for Whispering), The Hoosier Hot Shots, Pee Wee King, and the Sons of the Pioneers. Folks around Canton would gather around the radio and listen until the batteries gave out. Many mountain musicians learned part of their repertoire from these radio shows, listening intently to the melody and words since they knew it might be months before they would hear the song again. The fiddler in the first Smathers band did not want to learn these “modern” tunes such as Alabama Jubilee; and so, at 16 Luke took up the fiddle himself. He first learned to play the melodies, then to improvise around the tunes in a style that combined the rhythm of mountain music with the improvisations for blues and swing. 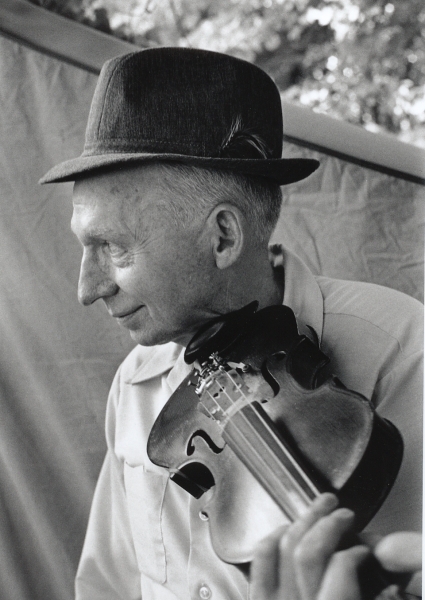 An important influence on Luke’s fiddling was Pender Rector (a fiddler from Asheville, NC, Pender broadcast regularly over WWNC and was recognized as one of the area’s great fiddlers. He was one of the first to play the big band and popular tunes on the fiddle, giving a syncopated and bluesy feel to his music and he was a favorite fiddler of young Luke. Older brother Harold learned to sing a wide range of songs from local musicians and the radio. They were lucky to have a sister who took short hand. She would write down the words coming over the radio, while the brothers would remember the tunes. Luke has notebooks filled with words to old pop songs, some still in shorthand. Over the past few years Luke has been writing down the titles to all the songs he knows. He stopped at 500 but is sure there are at least a hundred more he could add. Cousin J.T. Smathers played mandolin in the early days of the band until he went away to college and learned to play bass with an eight piece dance orchestra. His fine style of walking bass was developed during this big band period. Strong rhythm has always been important in the Smathers Band. Along with Harold’s driving “slap” guitar style, it has been the job of the tenor banjo to keep this solid beat. Neighbor and distant relative Quay Smathers played tenor banjo with the band from early 30’s to 1943. In fact it was Quay that got Luke, Harold and J.T. to start playing music again in 1968. Quay continued to play with them until 1970 when his daughters got old enough to start their own family band, the Dutch Cove String Band. Charles Gidney, great nephew to Luke and Harold, first heard the Smathers Band when he was a boy in the late 1930’s. The band would play at his grandmother’s ice cream socials. They were his favorite group and even in those days he felt there was “no comparison” between them and the other bands around Canton. It was in 1973 that Charles began coming over to Luke and Bea’s for the Sunday night picking. Luke asked me to play banjo with the band in 1975. I have tried to follow in Quay’s footsteps using a tenor banjo style for the swing tunes, and adding clawhammer style for the mountain songs. I’ve even been learning 3-finger style banjo to fit in with the bluegrass numbers we do. When we began work on this record we were concerned that we wouldn’t be able to capture the full life of the music as we hear t on Sunday nights. But once the recording session began and we settled in, we were able to do everything in one or two takes. We all feel satisfied that what we have caught here are truly the sounds from Bea’s kitchen.